VOSAP Essay Competition yielded following outcomes. 3,000+ college going students were inspired for the need of inclusion and accessibility for Divyangjan. On Dec 1st, winners will be awarded with certificate and monetary prizes starting form Rs 50,000 to Rs 1,000. Plus all participants to receive Certificate of volunteering for participating in the Essay Competition. 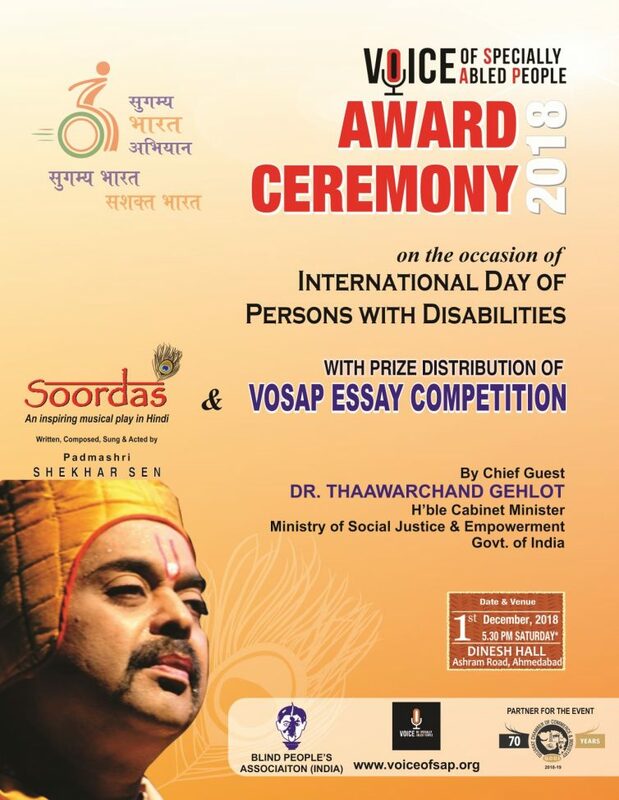 VOSAP is grateful to Govt of India wherein H’ble Cabinet Minister Dr Thaawarchand Gehlot ji will grace the occasion as a Chief Guest along with the team from Ministry of Social Justice and Empowerment (Secretary of Dpt of Empowerment of PwD, Chief Commissioner of India for PwD, Dy Chief Commissioner of India for PwD) and to GCCI (Gujarat Chamber of Commerce and Industries) to extend the partnership for the event and our corporate sponsors who have supported our cause to Empower Divyangjan and encourage our 1,000+ compassionate volunteers of Ahmedabad. On Dec 1st, to spread awareness, message of VOSAP, Padmashri Shekhar Sen ji has agreed to perform “Soordas”, great poet and devotee of Lord Krishna. VOSAP is proud to have BPA as execution partner for this Dec 1st event. This event is for supporters, sponsors of VOSAP cause and entry to program is only by invitation so we encourage you all to consider supporting the event as sponsor – starting at Bronze level (2 passes) for Rs 5,000. If interested, you can contact following VOSAPians of Ahmedabad.